Scientists rush to find the cause of natural instability, & whether it could happen again – From Australia, Dr. Laurie Menviel. Matt Fitzpatrick, head of Global Change & Biodiversity Lab – with a map showing the future climate for most cities in North America, & one for Europe. Plus British journalist George Monbiot at Extinction Rebellion. Just before everyone rushes outdoors to garden or summer vacation, please remember our global audience will continue to download thousands of Radio Ecoshock shows. That costs money. Producing the show and staying alive costs money. Please donate if you can. There is no big foundation supporting this show, no corporate sponsors. It all depends on you as a listener and blog reader! The great southern ocean, reaching down to Antarctica, has absorbed up to 10% of our greenhouse gas emissions. Without that we would be much hotter already. But that ocean sink appears to be weakening. In a worst-case scenario scientists, are exploring why carbon dioxide jumped 40 parts per million in a few decades not so long ago, and whether that natural increase in warming gases could happen again. Dr. Laurie Menviel is a leading scientist in the field, with many papers. She is currently a researcher at the University of New South Wales in Australia. Laurie was just awarded the 2019 Dorothy Hill Medal for her work as a ground-breaking young scientist. It appears that in Earth’s latest glacial times, the planet’s climate went rogue, departing from the previously predictable cycles caused by our orbit and tilt. A predictable pattern of ice ages and warmer times was broken. Earth entered much longer colder ice ages, just at the time homo sapiens was emerging on this planet. That means the planet itself has an internal climate sensitivity that is not dependent on our position relative to the sun. We need to know how that works, because humans may be triggering that kind of process, this time toward warming. WESTERLY WINDS BLOW UP MORE CARBON? As we learn in this interview, around 16,000 years ago, a CO2 rise happened over mere decades, probably due to more intense westerly winds in the southern hemisphere. We are seeing a big change in southern hemisphere winds now, as the strongest winds retreat from Australia and gather closer to the South Pole. Most climate science is still coming from the Northern Hemisphere. We know a lot more about the North Atlantic than the South Atlantic. I wonder if a bias has developed that favors the Arctic as a driver of big changes, while leaving out important developments in Australia and the Antarctic. But now we have a detailed map of 1.5 million years in the Southern Ocean. That paper is “The residence time of Southern Ocean surface waters and the 100,000-year ice age cycle“, published March 8, 2019. In the same issue of the journal Science, Laurie Menviel published her article “The southern amplifier“. But the case of the rapid 40 ppm CO2 rise comes in this earlier Menviel paper, published in Nature Communications, July 27, 2018 “Southern Hemisphere westerlies as a driver of the early deglacial atmospheric CO2 rise“. “Such amplification may also occur as a result of anthropogenic emissions. The atmospheric CO2 concentration is now at its highest point since at least 800,000 years ago. The ocean has strongly mitigated this atmospheric CO2 increase, particularly in the Southern Ocean, which has absorbed ~10% of the emissions. In new science, just published in Nature March 25th, a team of researchers announce that Greenland’s greatest source of sea level rise, the Jakoshavn Glacier has reversed from record ice loss to a gain of ice over the past two years. Apparently this shows again the very big role of ocean temperatures modulating ice loss – another Laurie Menviel specialty. Would you like to move your city to somewhere warmer? No need. According to new science, that different climate will probably come to you. By the end of this century, some American cities will experience climates never seen before. Our tour guide is the lead author of a new paper published in Nature. 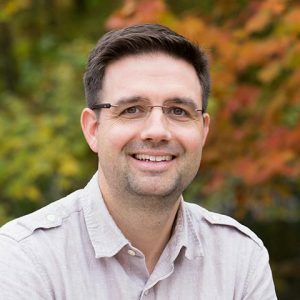 Matt Fitzpatrick leads the Fitzpatrick Lab Global Change & Biodiversity, at the University of Maryland Center for Environmental Science Appalachian Lab. He is listed as the “Principal Investigator,” with a team of scientists, and over 50 papers published. On February 12, 2019, Matt and Robert Dunn published the paper “Contemporary climatic analogs for 540 North American urban areas in the late 21st century“. They also gave America a tool to see the climate destination of their city. Find that interactive map at tinyurl.com/urbanclimate . Their research covered about 75% of the population of the United States, and around half the population of Canada. In just one example from data in this paper, for Washington D.C. the annual average high temperature would be ten degrees F. warmer by 2080 under the current trajectory of RCP8.5. Washington would also get an extra ten inches of rain as an annual average. It’s going to be a lot hotter and wetter in the nation’s capital, where politicians currently do nothing about climate change except empower fossil fuel companies to make it worse. In the end, it might seem like AMERICAN CITIES ARE MOVING on the map. That is another way of looking at the impacts of climate change. Plus, remember these big changes are just what can happen on our current path by 2080. Warming will continue for centuries after. A similar map for European cities was published by Guillaume Rohat, et al. in 2018: “Characterization of European cities’ climate shift – an exploratory study based on climate analogues“. “USA Cities ‘Will Experience Climates with No Modern Equivalent‘” in the Daily Galaxy and “Climate of North American cities will shift hundreds of miles in one generation” in Science Daily. Much of Matt’s work is based on the study of “phenology“. This is defined as: “the study of cyclic and seasonal natural phenomena, especially in relation to climate and plant and animal life.” In another topic, I thought global warming was developing too fast for evolution to help species cope. But Matt and his colleagues study genetic adaptation. I worry about this under-reported story from Matt’s work: “Aquatic ecosystems are considered among the most vulnerable and endangered in the world, with the projected future extinction rate of freshwater fauna rivaling estimates for tropical rainforest species.” We never talk about that or hear about that in the media. How serious is the freshwater extinction situation? Find Matt’s other papers here. On March 28th, journalist and author George Monbiot spoke at Oxford University, organized by Extinction Rebellion. In this show I condense a few clips from that talk, available in full on You tube. At the end of last week, major cities in Korea were threatened by wildfires. Early fires have already appeared in western North America. 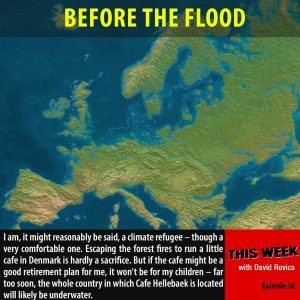 Song-writer David Rovics realized he is an early climate refugee, avoiding the summer smoke in Portland Oregon, for a coffee-house in Denmark. But then, projections for rising seas show Denmark could disappear as a country, as surely as low-lying Pacific Islands. Nobody escapes global climate disruption. Regular listeners can see all this coming, direct from our breaking science. I’m Alex Smith. Thank you for listening. Stay tuned to your future, with Radio Ecoshock. Monbiot is a pro EU, open borders, global-capitalist shill.His eco-future is a dystopian,surveillance state of nuclear power & rampant hi-tech “solurions” like GM plants & animals .Do not trust this man.